This week, the Asian Development Bank (ADB) launched Finding Balance 2016: Benchmarking the Performance of SOEs in Island Economies. The study, produced by ADB’s Pacific Private Sector Development Initiative, compares the financial performance of state-owned enterprises (SOEs) across 12 countries: eight Pacific countries, as well as Jamaica, Mauritius, Singapore, and New Zealand. The results are sobering. SOEs’ performance overall lags behind their private sector counterparts. PNG’s SOE portfolio generated an average return on equity (ROE)—profit as a percentage of equity investment—of just 2.4% from 2010 through 2014. Over the same period, the portfolio’s average return on assets (ROA)—profit generated by the firm’s total assets—was only 1.3%. 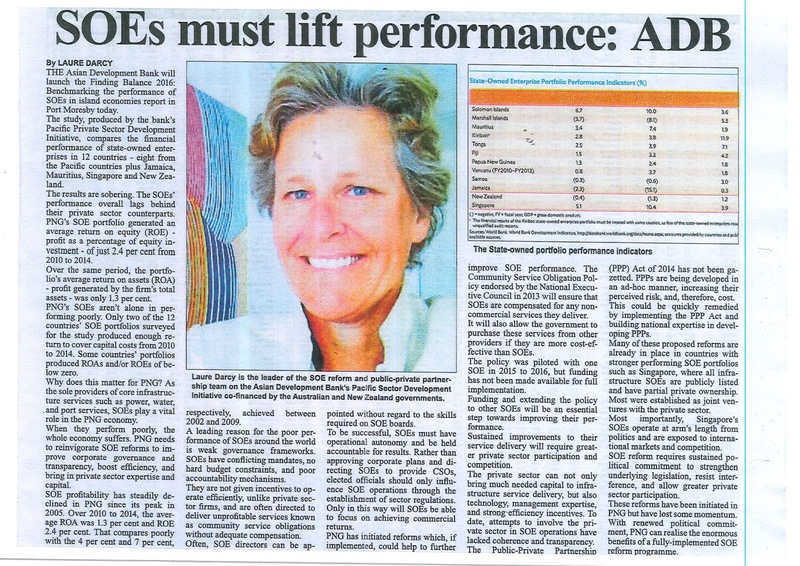 PNG’s SOE’s aren’t alone in performing poorly. Only two of the 12 countries’ SOE portfolios surveyed for the study produced enough return to cover capital costs from 2010 to 2014. Some countries’ portfolios produced ROAs and/or ROEs of below zero. Why does this matter for PNG? As the sole providers of core infrastructure services such as power, water, and port services, SOEs play a vital role in the PNG economy. When they perform poorly, the whole economy suffers. PNG needs to reinvigorate SOE reforms to improve corporate governance and transparency, boost efficiency, and bring in private sector expertise and capital. SOE profitability has steadily declined in PNG since its peak in 2005. Over 2010 to 2014, average ROA was 1.3% and ROE 2.4%. That compares poorly with the 4% and 7%, respectively, achieved between 2002 and 2009. A leading reason for the poor performance of SOEs around the world is weak governance frameworks. SOEs have conflicting mandates, no hard budget constraints, and poor accountability mechanisms. They are not given incentives to operate efficiently, unlike private sector firms, and are often directed to deliver unprofitable services known as community service obligations without adequate compensation. Often, SOE directors can be appointed without regard to the skills required on SOE boards. To be successful, SOEs must have operational autonomy and be held accountable for results. Rather than approving corporate plans and directing SOEs to provide CSOs, elected officials should only influence SOE operations through the establishment of sector regulations. Only in this way will SOEs be able to focus on achieving commercial returns. 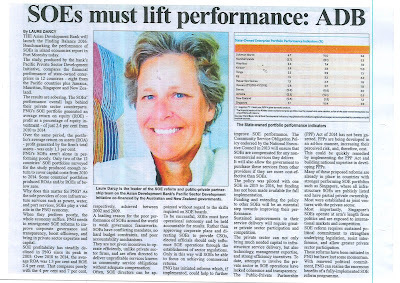 PNG has initiated reforms which, if implemented, could help to further improve SOE performance. The Community Service Obligation Policy endorsed by the National Executive Council in 2013 will ensure that SOEs are compensated for any non-commercial services they deliver. It will also allow the government to purchase these services from other providers if they are more cost-effective than SOEs. The policy was piloted with one SOE in 2015-2016 but funding has not been made available for full implementation. Funding and extending the policy to other SOEs will be an essential step towards improving their performance. Sustained improvements to SOEs’ service delivery will require greater private sector participation and competition. The private sector can not only bring much needed capital to infrastructure service delivery, but also technology, management expertise, and strong efficiency incentives. To date, attempts to involve the private sector in SOE operations have lacked coherence and transparency. The Public-Private Partnership (PPP) Act of 2014 has not been gazetted. PPPs are being developed in an ad-hoc manner, increasing their perceived risk—and, therefore, cost. This could be quickly remedied by implementing the PPP Act and building national expertise in developing PPPs. Many of these proposed reforms are already in place in countries with stronger performing SOE portfolios such as Singapore, where all infrastructure SOEs are publicly listed and have partial private ownership. Most were established as joint ventures with the private sector. Most importantly, Singapore’s SOEs operate at arm’s length from politics and are exposed to international markets and competition. SOE reform requires sustained political commitment to strengthen underlying legislation, resist interference, and allow greater private sector participation. These reforms have been initiated in PNG but have lost some momentum. With renewed political commitment, PNG can realize the enormous benefits of a fully-implemented SOE reform program. This piece was originally published in The National on 22 September 2016.